Former Fed Bank Examiner Says Secret Tapes Show Fed Leniency The former Fed employee recorded 46 hours of meetings using a small device on her keychain. 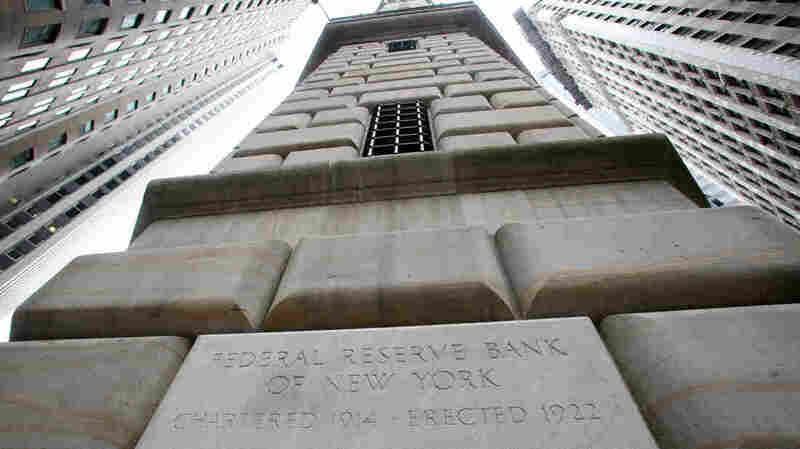 The concern, says ProPublica reporter Jake Bernstein, is the Fed may be too cozy with banks it oversees. A former Federal Reserve employee says that audio recordings show Fed examiners being too gentle with the banks they regulate. The Federal Reserve is among the most powerful institutions in the nation and also among the more private. But new audio tapes secretly recorded by a former employee provide a rare look into meetings involving officials from the Federal Reserve Bank of New York. In them, you hear officials considering how to oversee Goldman Sachs, and specifically, they discuss a financial transaction that one official describes as "legal but shady." Click here to hear This American Life's "Secret Recordings of Carmen Segarra"
The recordings were made in 2012 by Carmen Segarra, who at the time was a New York Fed bank examiner, charged with making sure banks followed the rules. She felt the Fed was going too easy on a powerful and very well-connected investment bank. She was later fired. She sued the Fed, which made some news. Segarra recorded 46 hours of meetings using a small audio recorder on a key chain. She gave those recordings to Jake Bernstein, an investigative reporter from ProPublica, and to the public radio program, This American Life. The concern being raised by the recordings, Bernstein tells NPR's Steve Inskeep, is that regulators may be too cozy with the banks they oversee. "These are people who work inside the banks. They see these people every day, and they need to obtain the information from these banks, and it's easier to obtain the information if you're friendly and if you have a good relationship, but sometimes that can slide to deference," Bernstein says. Goldman Sachs says that the concerns raised in Segarra's examination were off base. Carmen Segarra is a lawyer. She had about 15 years of experience helping banks comply with rules and regulations, and then after the financial crisis she applied for a job at the New York Fed because she says that she wanted to do something that would help the financial system and help prevent these kinds of things from happening in the future. On the deal that Mike Silva, the head Fed official inside Goldman, is recorded as describing as "legal and shady"
This was a deal between Goldman Sachs and a Spanish bank called Banco Santander. Banco Santander's European regulators were telling it to hold more capital [in case the investments go wrong]. And so what Goldman was doing was they were taking some of the assets off of Santander's books. They were going to hold them for a few years, which would let Santander hold less capital. My own personal thinking right now is that we're looking at a transaction that's legal but shady. I wanna put a big shot around their bow on that. Poking at it, maybe we find something even shadier than we already know. So let's poke at this thing, let's poke at it with our usual poker faces, you know, I'd like these guys to come away from this meeting confused as to what we think about it. I wanna keep 'em nervous. That's the only time that Silva asks about the no-objection issue. Goldman did mention it in the meeting, and they said that the clause didn't actually mean what it appeared to say, and they in fact didn't require a no objection from the New York Fed. The Fed did. They commissioned a report in 2009 that said the biggest problem at the Fed was its own culture – the deference, the fear of speaking up and suggested that they hire expert examiners who would speak out and contradict their bosses – people like Carmen Segarra.